A video by Kerry for our 3rd entry for March VoM. A video of Astros 1st performance in 2012 which debuted them dancing to Ruth's dance chereography (first showcased by niners in HO 2012). This is also a brand new routine which featured the first time Harlis performed for Astros. May Astros have a great year ahead. 2nd entry for March VoM is by Winston. Toss cupie to hands to cupie heelstretch. Winston had improved alot from last seasion to this seasion and he is a great example of not giving up. At times even when others may be moving faster than him, he knows that as long as he does not give up, he will overtake them one day. Jiayou. The 1st entry for March VoM is by Jancye. A video of Alpha Verve performance at Heartland Chingay. An ASU routine and what makes it even special for them was the last minute substitution of a player who got injured. 2nd Blog Post of the Month March is a post by Ochi. 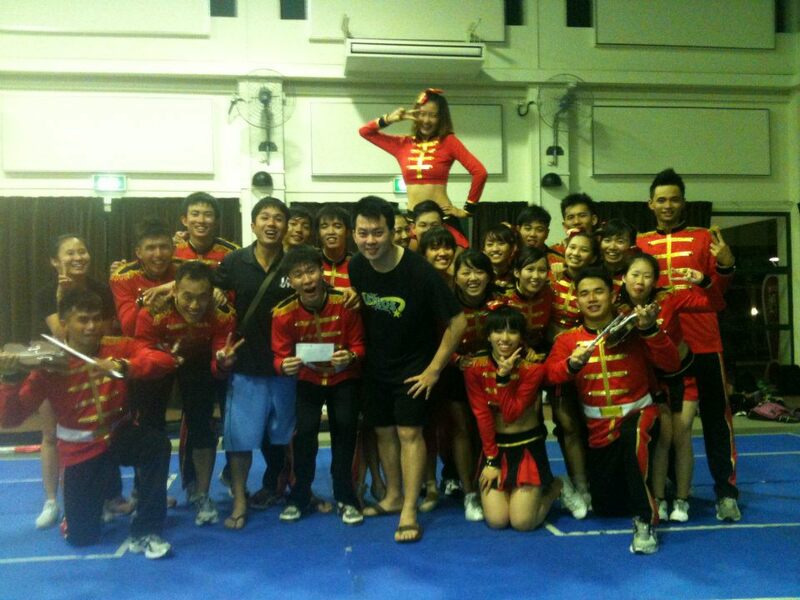 This is a post that summarises NTU HO Cheerleading that had just ended. "I hope HO 2012 has been an awesome experience for all those competing. Subsequently we also strongly encourage those who would like to take their passion further and continue to compete in SNCC 2012!!! Your cheer journey only starts now! It is nice to see each Hall team coached by a wide variety of coaches from various teams coming together to put up a wonderful show that night. The 1st entry of BPOM March is by Winston and tagged by Ken. It is a post about Winston's 1st coaching experience with NTU Hall 3. The winner for BPoM January '12 is by Ser Kun. He won himself $100 ($50 brought over from Dec). Congratulations. The winner for BPoM Feb'12 goes to the 1 and only entry by Ochi titled,"Its not just about winning rather having passion. ", and tagged by Gary. Congratulations Ochi, you have won yourself BPoM as a author and not as a "tagger" haha; for the prize of $50. Ochi's Blog Post: Its not just about winning rather having passion. Sometimes it is really wonderful on how you can link cheerleading to so many things. Ochi linked cheerleading to his passion for playing tennis and was able to discover for himself what went wrong for him previously. As to how one would quantify ''trying hard enough'', I would probably liken it to performing at the fullest of your potential; and not giving yourself 1001 excuses on why you failed to succeed. And I am somebody who believe that the day you run out of excuses for your failure, is the day you will succeed. PS: We would like to remind all bloggers who intends to register for BPOM to highlight the source of any quotes you may use in your blog post. Once upon a time, there were a bunch of little chicks who lives the under the mountain. Very often, they look up in the sky and admire the eagle gliding through the sky gracefully. And in their heart, they want to do the same. One day, chick leader proposed that they should all go up the mountain and look for the eagle to teach them how to fly. 10 of them agreed and the all prepare themselves to go up the mountain. At the middle, some chicks were so tired of the climbing, they gave up and went back to their nest. 5 carried on with the journey. Finally, they reached the top. Upon stating their request, the eagle was more than willing to give them a hand. The condition was, they must first jump down the cliff, 3 chicks gotten scared and went back to their nest in disbelief. The two chicks jumped down at the same time, and they started flying down to the bottom of the mountain. They were extremely happy that they were able to fly, they run all the way back up to the mountain and said thanks to the eagle and climb down the mountain, back to their nest. What are the MORALS OF THE STORY? 1.) Some give up in the beginning. 2.) Some give up half way. 3.) Some tried hard but gave up at the final step. 4.) Only a few managed to succeed, however, among this few, they may revert back to their old self if they did not continue practicing the new found skill. Recently I’ve interviewed our Singapore Cheer Idol, Mr. XWonder for his Top 5 criteria that constitute a good cheerleader. Below is the report for everyone else’s knowledge. Passion, defined as any powerful or compelling emotion or feeling, such as love or hate. A passion that is sustained through till your deathbed is sustained passion. Everyone faces ups and downs in life, and similar in our cheerleading career. Initially he mentioned the word passion. However, he felt that sustained passion would be a stronger word as cheerleading path is no easy than any other sports and also one that required time, energy and effort to begin to see some results. He feels that a good cheerleader must have the passion and love to this sports even to the extent giving up other passion. He actually shared with me how a soccer fanatic he was before he decided to go full gear on cheerleading. He always played soccer throughout his life even after he got in touch with cheerleading, he would still priotise soccer over cheerleading. It is only until one point of time that he decided to give up his passion for soccer and redirect this undying passion into cheerleading. And this is what that, he felt, the top most important criteria a good cheerleader should have. An undying and sustained passion for cheerleading. And this also reminded me of what my mentor had taught me as well. Many times people do certain because they want to prove to some other people wrong perception about themselves. Eg. They looked down on me, so I want work hard, train hard and win to prove them all wrong. A typical example of responsibility is our parents. If you may, ask your parents today, “Dad, Mom, do you love your job?” Most probably, they will answer you “Absolutely NO” Then the question would be why would they stay on their job? The answer is very simple, because their children are their responsibilities. They worked because they are responsible for their child welfare, education and etc. True indeed that the greatest of all is LOVE. It is only through TRUE LOVE that we find doing something fruitful and rewarding, that we are willing to do anything without any return. I’ve seen many winners and champions were born. Anger may win you champion, but it will not last. Once you have satisfied your ego, you will find other things to boost your ego. Responsibility may bring you somewhere, but you will feel extremely tired and eventually leave. But those who loved this sport with an undying love never find doing anything related with cheerleading a chore and they will strive for another level up. If you find yourself not achieving the result you want, maybe you have not fell in love with this sport yet. Search for your passion for cheerleading and make sure it is sustainable. He felt that willingness to learn has to be on the top of everyone’s list if they wish to go far as a cheerleader. Knowledge, skills, techniques improves and evolves very quickly and rapidly, if you are not willing to learn, you will soon find yourself stagnant and out dated. There should not be any excuses anymore nowadays in this era of information. If you are willing to learn, there is always a way. With XWonder’s courtesy, he actually wrote the below passage and he would like to share with us an example, of how one can go all out to learn. ‘Ken Lim, most serious cheerleaders will know him now, 2 times National champions with Wildcards Cheerleading Team, was not always as well known as he is now. Ken used to be a nobody in cheerleading, a cheerleader that no one knew and would thought he would ever become a National Champion. Ken epitomises the true meaning of willingness to learn. The first time I met Ken was in NP. Ken was still in TP Blazers back then. I remembered that I shared, showed and taught him a few things that day, and after that day, he continued to follow up with us, and is even willing to travel after school all the way from Tampines to Boon Lay just to spend some time with us, just to learn something from us, the undisputed reigning champions then. I believed that was also the reason why I met him all the way at NP too, because of his willingness to learn and to take that a step further, going all out of the way to learn. Without first having the willingness to learn, one will never go out of his comfort level to learn from someone else. Ken did not restrict his learning only when he was around, but also constantly stayed in touched over the internet, msn chat etc. He would always ask for advice and opinions. This showed again if one is willing to learn, nothing can stop them, especially now in this high tech information age. Later on he proceed on to joining Wildcards and take his learning to another level, to the championship level, to practice what you learned. Many people know of our local Singapore Cheer Idol, XWonder and can guess that he had to put in a lot of hard work to reach this stage. Many are eager to ask him for advice on how to improve on their techniques and skills. But has anyone ever ask about the exact process he’s been through? I did and I will share with you all now. Many people would laugh or take it as a joke when he tell them that he did nothing but elevators, elevators extension, elevator pops, elevator this and that for the first 2 years of his cheerleading journey. He and his teammates, did not even call it elevators back then, it was called double base. As the name suggest, it is always 2 base plus 1 back spot lifting a flyer. Partner stunts, or single base which they prefer to call it back then was something very rare and hard to do. This was because they had lack of information and help back then, of course, it was not till they went all out and even overseas to get them. Most people now would have quit cheer if the coaches asked them to just do elevators for 2 long years. Though now we must say that it is not necessary to spend 2 years doing just elevators, but XWonder was really glad that he did back then. During those 2 years, it really did help setting up his foundation very strongly, of how to use proper momentum, how to use proper strength and how to coordinate with a fellow base. Now things are different, it would be unwise to just focus on elevators, but he would like to use the above example to illustrate to people the importance of proper basics first. It may be very tempting to try high level partner stunts when you see others doing them, but one should ask themselves, “Have I done enough basics? Are my basic techniques strong enough?” Talking about elevators may not resonate with the younger generation now, then how about we talk about toss to hands. If you cannot get your toss to hands right, do not even think about going for the toss cupie. Different individuals may have different learning curve, some may start fast and wane later, some may start slow but boom later on. Whichever stage you are at, always clock enough “mileage” before you move on to the next step. XWonder personally must have toss over 10,000 times before he dare say he can do toss to hands, or before going for the toss extension. So if you are stuck at doing full up cupie, make sure you go 1 level down and do 10,000 proper full up extensions first. Always remember taking one step a time, down to earth doing repetitions after repetitions is the key to success in sports and cheerleading is no exception. In XWonder’s opinion, a good cheerleader, must be able to give values to the team. Cheerleading is not only about partner stunts, it includes gymnastics, dance, spirit, and etc. While mastering the art of one, good cheerleaders strive to excel in others as well, and not surrendering to the fate that they are just not meant to do partner stunts, or not meant to do gymnastics, or not meant to do high basket tosses. Many aspects of cheerleading have been neglected or ignored by younger generation and that include things such as choreography, music mixing learning to be a coach too. For Singapore cheerleading scene to boom, we would require more talents and committed players to move up the level and start coaching teams. He felt that the ability to manage relationship is not only a quality one must have in cheerleading, but also a must have quality in life. Everyone has different personality, characteristics, values, strength and weaknesses, not everyone may see eye to eye and agree on the same thing and this uniqueness of each individuals is what that usually give rise to arguments, “online wars”, bad mouthing each other, strains between players, coaches and between teams. He feels that the better man does not have to win every single argument or war, the better man will learn to take a step back. What is the point of winning an argument and then losing a friend or teammate, or straining relationships? A lot of times our actions also might be an eyesore to certain people. We all need to learn what should be said and what should be done at a particular time and particular places. In his opinion, one will never go as far as you could have without the help and blessing of fellow cheerleaders. I’m always glad that felt blessed that I have a group of friends and teammates who supported my decision to move on and pursue what I really wanted. That is to improve and to achieve something and leave a legacy behind where my descendants would talk about after my departure. If you had made some enemies along the way, try to make peace with them and start paying attention to your speech and actions in future. In his entire journey as a cheerleader, nothing causes more problems than what comes out of people’s mouth and the actions their hands and legs do. Usually some older cheerleaders like himself only realised this important point much later in their cheerleading career, but by then it may become very difficult to turn back time and reverse the damage that was already done along the way even if you want to. So young cheerleaders, do take this advice and start building better relationships with your fellow teammates, coaches of your team as well as with other teams. Both XWonder and I would strongly recommend everyone to read the book “How to win friends and influence people”. It is a book that taught us how to relate with people better and brought our respective career to another level higher. The 1st entry of BPOM February is by Ochi and tagged by Gary. It is a post titled,"Its not just about winning rather having passion." This post is from way back in 2010, exactly about 2 years ago; re tagged by Gary and also a timely reminder to all champions in the making. The post talks about regrets, then about the difference in wanting to win and doing the right thing. It moves on further to add that passion is still the ultimate multiplier effect. I sum it up in 1 sentence,"A champion has to have the want to win, and then go do the right things and fueled by passion, whatever the result may be, you may possess the regret of losing, but never will you possess the regret of not trying hard enough.